Scanned and Formated by Adam Bootle. Last revised 18 April 2013. The alignment optical telescope, mounted on the navigation base to provide mechanical alignment and a common reference between the telescope and the inertial measurement unit, is a unity-power, periscope-type device with a 6 conical field-of-view. It is operated manually by the astronauts. The telescope has a movable shaft axis (parallel to the LM X-axis) and a line-of-sight approximately 45 degrees from the X-axis in the Y-Z plane. The telescope line-of-sight is fixed in elevation and movable in azimuth to six detent positions. These detent positions are selected by turning a detent selector knob on the telescope; they are located at 60 degree intervals. The forward (F), zero detent position, places the line-of-sight in the X-Z plane, looking forward and up as one would look from inside the LM. The right (R) position places the line-of-sight 60 degrees to the right of the X-Z plane; the left (L) position, 60 degrees to the left of the X-2 plane. Each of these positions maintains the line-of-sight at 45 degrees from the LM +X-axis. The remaining three detent positions reverse the prism on top of the telescope. These positions are right-rear, closed (CL), and left-rear. The CL position (180 degrees from the F position) is the stowed position. The right-rear and left-rear positions have minimal use. The optics consist of two sections: shaft optics and eyepiece optics. The shaft optics section is a -5 power complex that provides a 60 degree field-of-view. The eyepiece optics section is a +5 power complex that provides shaft and trunnion angle rneasurements. 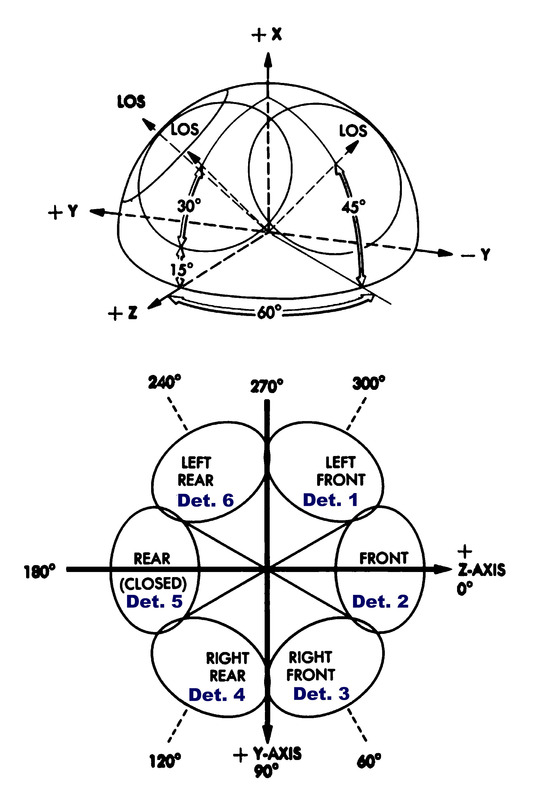 The reticle pattern within the eyepiece optics consists of crosshairs and a pair of Archimedes spirals. The vertical crosshair, an orientation line designated the Y-line, is parallel to the LM X~axis when the reticle is at the 0 degree reference position. The horizontal crosshair, an auxiliary line designated the X-line, is perpendicular to the orientation line. The one-turn spirals are superimposed from the center of the field-of-view to the top of the vertical crosshair. Ten miniature red lamps mounted around the reticle prevent false star indications caused by imperfections in the reticle and illuminate the reticle pattern. Stars will appear white; reticle imperfections, red. Heaters prevent fogging of the mirror due to moisture and low temperatures during the mission. reversed in the original figure but are correct here. A reticle control enables manual rotation of the reticle for use in lunar surface alignments. A counter on the left side of the unit, provides angular readout of the reticle rotation. The counter reads in degrees to within �02" or � seconds. The maximum reading is 359.88 degrees, then the Counter returns to 0 degrees . Interpolation is possible to within �01 degrees. A rotatable eyeguard is fastened to the end of the eyepiece section. The eyeguard is axially adjustable for head position. It is used when the astronaut takes sightings with his faceplate open. 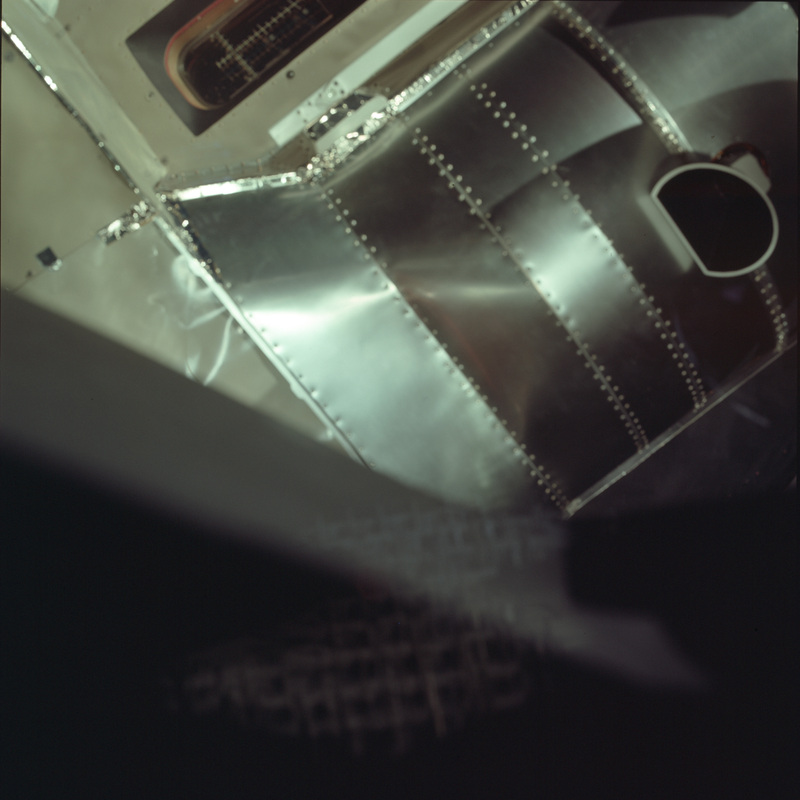 This eyeguard is removed when the astronaut takes sightings with his faceplate closed; a fixed eyeguard, permanently cemented to the telescope, is used instead. The fixed eyeguard prevents marring of the faceplate by the eyepiece. 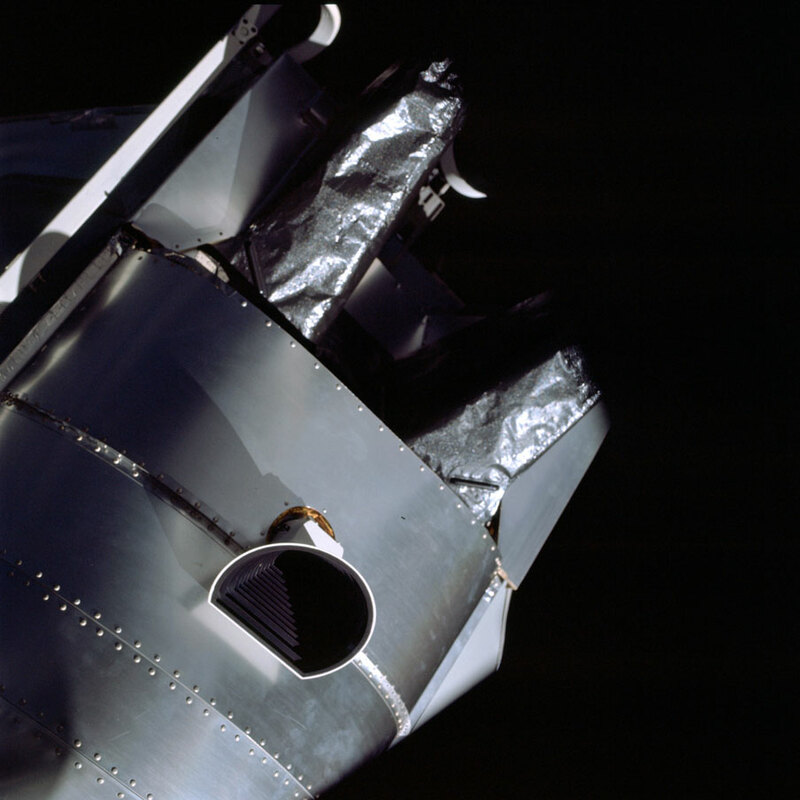 A high-density filter lens, supplied as auxiliary equipment, prevents damage to the astronaut's eyes due to accidental direct viewing of the sun or if the astronaut chooses to use the sun as a reference. The alignment optical telescope is used for in-flight and lunar surface sightings. For in-flight sightings, the telescope may be placed in any of the usable detent positions. However, when the LM is attached to the CSM, only the forward position is used. The astronaut selects a detent and the particular star he wishes to use. He then maneuvers the LM so that the selected star falls within the telescope field of view. 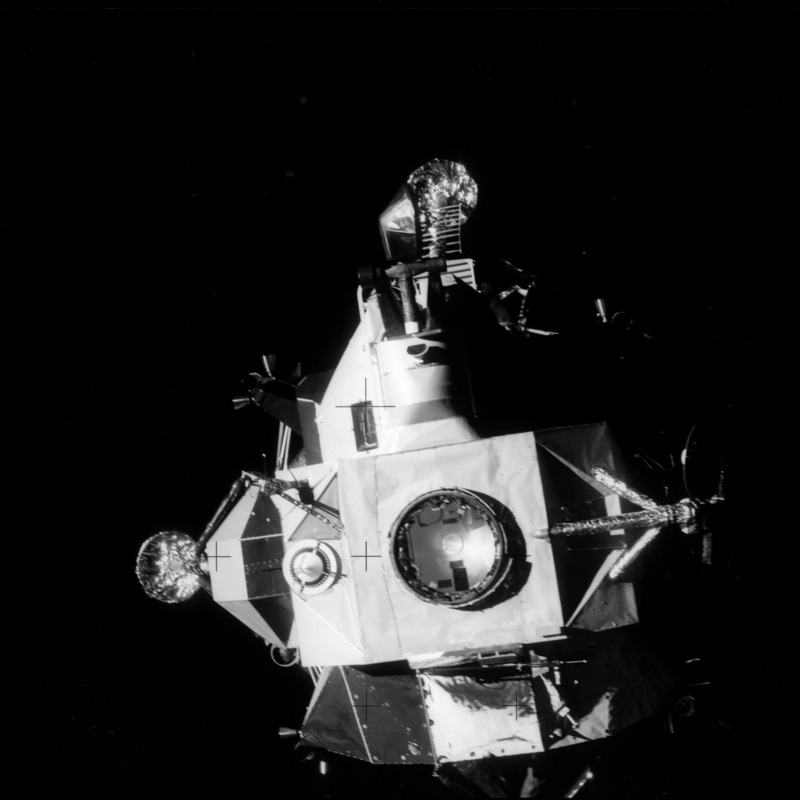 The specific detent position and a code associated with the selected star are entered into the guidance computer by the astronaut using the DSKY. The LM is then maneuvered so that the star image crosses the reticle crosshairs. When the star image is coincident with the Y-line, the astronaut presses the mark Y pushbutton; when it is coincident with the X-line, he presses the mark X pushbutton. The astronaut may do this in either order and, if desired, he may erase the latest mark by pressing the reject pushbutton. When a mark pushbutton is pressed, a discrete is sent to the guidance computer. The guidance computer then records the time of mark and the inertial measurement unit gimbal angles at the instant of the mark. Crossing of a reticle line by the star image defines a plane containing the star. Crossing of the other reticle line defines another plane containing the same star. The intersection of these planes forms a line that defines the direction of the star. To define the inertial orientation of the stable member, sightings on at least two stars are required. Each star sighting requires the same procedure. Multiple reticle crossings and their corresponding marks can be made on either or both stars to improve the accuracy of the sightings. 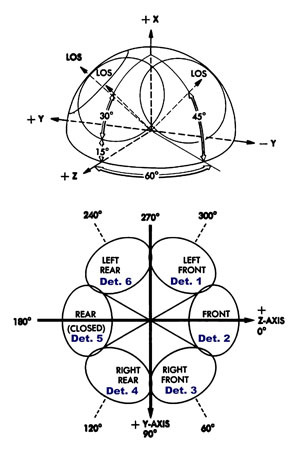 Upon completion of the second star sightings, the guidance computer calculates the orientation of the stable member with respect to a predefined reference coordinate system. 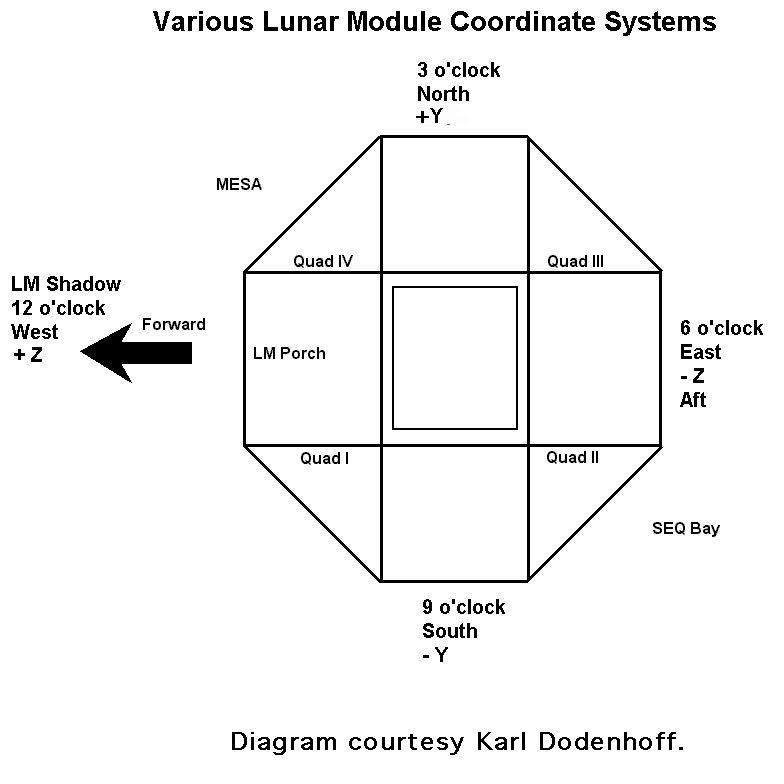 On the lunar surface, the LM cannot be maneuvered to obtain a star-image that crosses the reticle crosshairs. The astronaut using the reticle control knob, adjusts the reticle to superimpose the orientation (Y) line on the target star. The reticle angle display on the reticle counter, is then inserted into the computer by the astronaut. This provides the computer with the star orientation angle (shaft angle). The astronaut then continues rotating the reticle until a point on the spirals is superimposed on the target star. This second angular readout (reticle angle) is then entered into the computer along with the detent position and the code of the observed star. The computer can now calculate the angular displacement of the star from the center of the field of view by computing the difference between the two counter readings. Due to the characteristics of the reticle spirals, the angle is proportional to the distance of the star from the center of the field-of-view. Using this angle and a proportionality equation, the computer can calculate the trunnion angle. At least two star sightings are required for determination of the inertial orientation of the stable member. 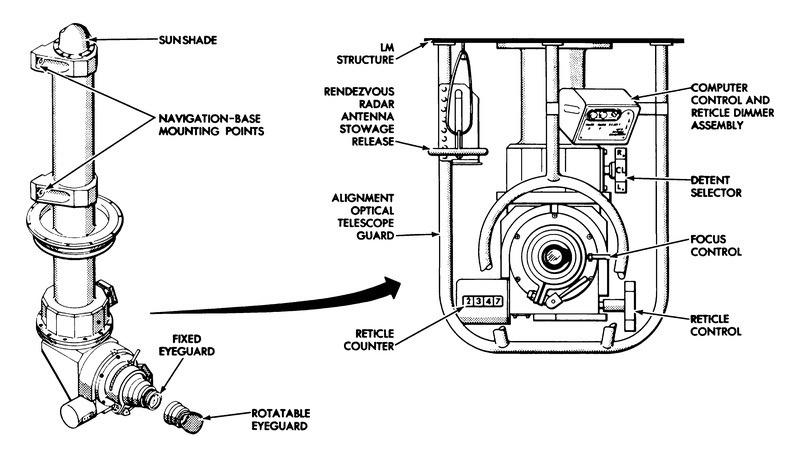 The computer control and reticle dimmer assembly is mounted on the alignment optical telescope guard. The mark X and mark Y pushbuttons are used by the astronauts to send discrete signals to the primary guidance computer when star sightings are made. The reject pushbutton is used if an invalid mark has been sent to the computer. A thumbwheel on the assembly is ussd to adjust the brightness of the telescope's reticle lamps.